So, you've probably heard that Betsy at Fuse #8 is compiling a list of the Top 100 Picture Books of All Time. Have YOU weighed in? You have until the end of March, so hurry hurry! I sent in my picks last week and I'm excited to see what books will make the cut. There are tons of awesome picture books and everyone's list is going to be different (which is why it's such an interesting question to ask!). So what were my picks? 1. 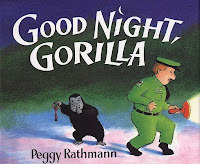 Good Night Gorilla by Peggy Rathmann - This is a classic picture book that works for a big range of ages. The story is funny and the pictures have a lot of adorable detail. It works with a group and it works one-on-one. I love it! 2. The Very Hungry Caterpillar by Eric Carle - This one is also a classic. It combines a fun story with counting, vocabulary, and food (which is something that a lot of kids love to read about). The bright illustrations pop off the page. 3. Leonardo the Terrible Monster by Mo Willems - Leonardo is my favorite of Mo Willems's books. The story is a little silly and the pictures are so funny! This is one of my favorites to read aloud because you can be a little dramatic with it. 4. Two Bad Ants by Chris Van Allsburg - This has been a favorite story of mine since my school librarian read it to our class in the first grade. I love seeing the world from an ant's point of view where a lawn can be a forest and a cup of coffee can be a lake. 5. Bark George by Jules Feiffer - I love Bark George because it always makes everyone laugh. Kids get a kick out of a dog who's making the wrong sounds and the punchline gets chuckles from the adults. 6. 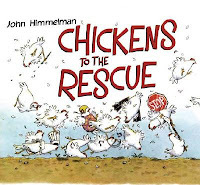 Chickens to the Rescue by John Himmelman - This is one of my favorites because there are so many great details in the illustrations. Every time I look at it I see something I didn't see before and the details are so funny! Ohhhh when will they make this in a big book format??? 7. How Much is a Million? by David M. Schwartz, illustrated by Steven Kellogg - I have a great love for nonfiction picture books and this is one of the best. Whenever I read it out loud, the kids' jaws drop and they get so excited to learn if these are really true facts. Nonfiction picture books like How Much is a Million? make kids (and adults) want to know more and to seek out more nonfiction picture books! 8. A Hat for Minerva Louise by Janet Stoeke - This is a great winter story and I love Minerva Louise. She is one silly chicken! Kids love pointing out the mistakes that Minerva Louise is making and I love the picture of her with a mitten on her head and one on her tail. 9. Dr. Seuss's Sleep Book by Dr. Seuss - This is another one that was a favorite of mine when I was little. My family would read it together and my brother & I loved pointing out all the different sleeping creatures. A fun bedtime book with lots to look at. 10. How Do Dinosaurs Say Goodnight? by Jan Yolen, illustrated by Mark Teague - This series is another classic series and it has staying power for a reason. A great rhyming text and humorous illustrations make this a great readaloud. Dinosaurs are popular with kids and this is one of the best! So what does this list say about my taste in picture books? I prefer funny books. I love books about animals. And I have a soft spot for books about silly chickens. I also notice a trend in liking books that are written and illustrated by the same person. Only 2 of these 10 books aren't illustrated by the author. Now you know what I picked for my top ten... what are your favorites? Email Betsy with your top ten or feel free to share your favorites in the comments or post them on your blog! When I get around to this, I'm going to have to put Leonardo on too. He is my fave of Mo Willem's books too. And he's SO MUCh FUN to read! Bark George might be on my list too ... I'm not sure. I'm still reworking things. I would have to add Caps for Sale and anything by Audrey Wood-either The Napping House or King Bidgood. This will take some thinking time, but I suspect Very hungry caterpillar will make my list. I'd probably go for How do dinosaurs eat their food. My gut reaction is that I might include Who's in the loo, by Jeanne WIllis and Ella Kazoo will not brush her hair, by Lee Fox. I also love Some dogs do, by Jez Alborough. Cool to see how everyone's list is different. This is getting me motivated to put mine up. It's just so hard to choose! This is a really great idea for a top ten list. The Very Hungry Caterpillar is one of my favorites, I am glad to see it ranked so high, I would also include Where the Wild Things Are, it is one of my favorite childhood picture books. anyone can post their own to our site http://www.toptentopten.com/. The coolest feature is you can let other people vote on the rankings of your list. I debated on Bark, George, but went with some older books instead. My list could almost be a timeline from the books that I liked as a kid, to the ones I liked as a mom, to the ones I liked as a librarian. At least it covers a lot of years.